When I was a kid, I didn't have any regular sport. I took Tae-Kwon-Do lessons for 2 years, but I don't consider it something I did regularly even after. I took swimming lessons but that was more to learn how to swim and not to undergo rigorous training. Contrary to the popular belief that every boy loves and plays basketball, I never did enjoy it. The few times I played with my high school friends was because I enjoyed their company more than the game. So, it may be safe to assume that I didn't have any regular sport then. I can't remember when I learned chess and who taught me but I do know that it wasn't my parents who taught me because none of them know how to play chess. And since I was an only child then, I had no one to play chess with. There weren't any computer-based chess games back then. It was kinda boring to play by myself too. So I guess my interest in the game just died a natural death. Lately though, with the help of Miguel, I've renewed my interest though in chess. Miguel is part of their school's chess club. The enthusiasm he has for chess is outstanding and enough for me to regain interest in the game, not to mention having a permanent chess opponent. It also made me realize that I have yet much to learn in terms of moves, techniques and foresight in the game. That's why whenever I get the chance, I play now for experience. 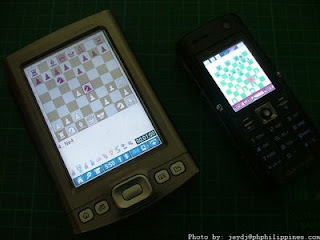 It also helps that I installed a java-based chess game on my mobile phone and the PDA that Aileen lent me also has one. I make it a point to play at least 2 games in a day to enhance my skills and learn more. And I just found out that Chess today is a recognized sport of the International Olympic Committee. So I guess I have a new sport, Chess ! Oo nga, both of you are so enthusiastic about it! I have to find something to do whenever you are at it. Miguel's really addicted to it and even plays by himself whenever we are at the mall. Chess is a great sport Jay. Also good for bonding. Whenever am away, I play chess through Yahoo Messenger with family members. Have fun!